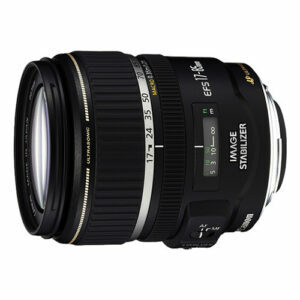 Lens Description: To meet user demands for a fast EF-S zoom lens, Canon has specially designed a new lens with a large aperture of f/2.8 for select Canon Digital SLR cameras. * The large circular aperture produces a shallow depth-of-field, creating background blur that draws attention to the photographic subject. The lens construction includes UD and aspherical elements, which deliver impressive image quality throughout the entire zoom range. Image Stabilizer lens groups shift to compensate for camera movement so that the image appears steady on the image plane, ensuring clear, crisp images, even in dim light. With a Ring-type USM, inner focusing and new AF algorithms, this lens achieves autofocus quickly and quietly, and with full-time mechanical manual focusing, manually adjusting the focus is possible even in AF mode.